While it hasn’t exactly been a barbeque summer, we’ve still taken every opportunity to have homemade burgers, especially since I got this recipe licked. While the burgers – be they thick, meaty beef ones, large flat mushrooms stuffed with blue cheese or a herby lamb variation -aren’t difficult, it’s not quite as easy to find decent burger buns. Those horrible flattened cardboard-type ones that you find in every shop are just an insult to a good burger and they have some seriously strange sounding things in their ingredient list. Of course, you can have a burger by itself with some skin-on, red rooster potato wedges but I love mine wedged into a good bread bun, along with some choice accompaniments – with the beef variation it’s normally sliced ripe tomatoes, blue cheese dressing, butterhead lettuce and tomato chutney. Enough to make the whole thing a bit of a challenge to get into my mouth, really. 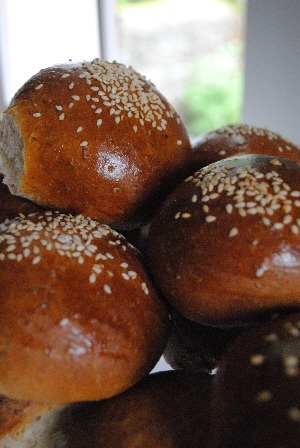 The dough for these buns is a bit richer than I’d want to eat every day but they’re soft to soak up all the gorgeous juices, strong enough so that they don’t fall apart at the first bite and, should you have any left over, taste fabulous when toasted the next day. I sometimes make these the evening before I want to eat them, shaping the buns and leaving them to rise in the fridge overnight. Bring them back to room temperature before glazing and baking. Beat the milk and eggs together, pour into the machine then cover with the white and wholemeal flours. Sprinkle over the cubes of butter and the sugar. Put the salt into one corner and the dried yeast in the centre. Use the dough setting and remove after rising. Warm the milk in a saucepan with the butter. When the butter is melted, cool to blood temperature (you should be able to dip a finger into the liquid without it feeling either hot or cold) and beat in the eggs. Mix the flour, sugar, salt and dried yeast together in a large bowl. Mix in the warm milk mixture. The dough should be soft and sticky. Knead, using as little flour as possible, for about 10 minutes until it becomes smooth and flexible. Rub the inside of the cleaned bowl with some soft butter, place the dough into it and cover with clingfilm. Place the bowl somewhere warm for 1 1/2 hours to 2 hours or until the dough has doubled in size. Gently fold the dough in on itself to release any air pockets. Butter two baking trays and divide the dough into either 16 small bread buns or 8 larger ones and place on the trays. Cover with a tea towel and allow to rise in a warm place until doubled in size. This should take between 30 minutes – 1 hour. Preheat the oven to 220°C (200°C fanbake). 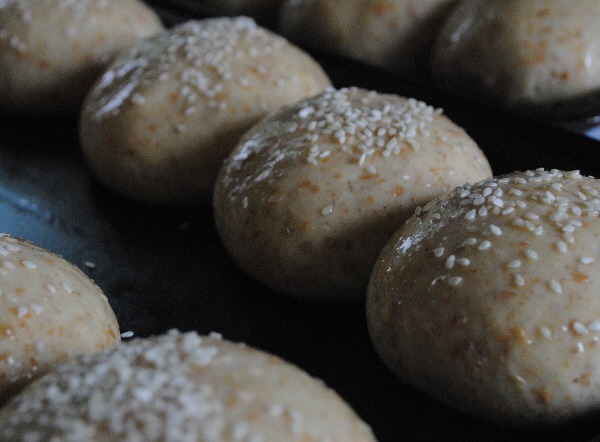 Glaze the buns with the egg/milk wash and sprinkle with sesame seeds. Bake for 12-15 minutes for small buns, 15-20 minutes for the larger ones, until they are golden brown and sound hollow when tapped underneath. Makes 16 small bread buns or 8 larger ones.